When new owners painted their buildings "Lime", "Tangerine" and "Raspberry", they had street signs made with that clever name! Our house looks down, across them, to the water, so when the sun broke through this afternoon, we grabbed the tripod and hurried across the way for some photos. The other day, Ken called and while I stood at the front door, he filled the screen with a photo of me in front of the house. Today, I realized that the compressed images of the buildings rising up the hill from the waterfront made a far better (and more joyful) composition! Someone said of my waterfront photo ( http://365project.org/Weezilou/365/2014-10-02 )that it would make a good jigsaw puzzle. This is the one I'd love to set out for my friends to put together! I just love all the colours! Very pretty! Wow what a colourful scene! It would make a great jigsaw! Very cool. It looks like a folk art painting. Love the large church. Ohhhh that would be a great jigsaw puzzle!!! Love the beautiful colors and charming houses/church!!! FAV!!! It looks like a painting, charming! 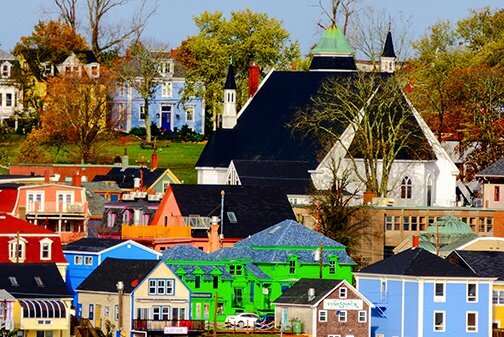 @annelis @irisn @pamknowler @kwind Yes, Lunenburg is known for all its colours! Like your comments, I thought the finished photo looked like a painting, but I only compressed the three bracketed images and used the "Photograph" finish. Certainly zooming in flattens the images, but if you could enlarge this picture, it's clear that those buildings really are just like that! We just love them! What a fabulous scene Louise, there's so much to look at. I love the vibrant colours of some of the houses. It would make a great puzzle! This is such a wonderful photo of color and fun. Who needs fall color change when you can have these beautiful colorful buildings! @pamknowler @hbdaly @danette @irisn @summerfield @wannabe @annelis @ethelperry @digitalrn Thank you all SO MUCH! FYI, Shutterfly is offering a $10 discount on top of their sale prices this weekend, so I'm ordering this as a "Thank you gift" for friends we're visiting in Halifax the end of the month...and one for ourselves... If you're interested in their promo, the code is "10dollars" and there are all sorts of gift items available at Shutterfly.com. (Ordering a Christmas ornament for our new grand daughter, too!) Thanks for the encouragement! Love this pic. looks like art we call the primitives. Artist that paint the world they live in ( often from memories) and did n`t have any education. They paint what they see. Lovely. Fav. Finally getting back to post my comment, I love this image. It reminds me of folk art or a calendar of Charles Wysocki. @Weezilou The perfect thoughtful personalized gift! I was very much a mono person until my wife introduced me to color. Now every time I see vibrant colors I think of her :). Hope all is well Louise! I have a friend asking how to take beautiful photos and I mentioned to her my project from several years ago and how the best thing I got out of it was connecting with great people. Made me come here and poke around the other day and seeing a few familiar names made me smile. Take care and all the best to the family. Sign up for a free account or Sign in to post a comment.